The King and his crop top. 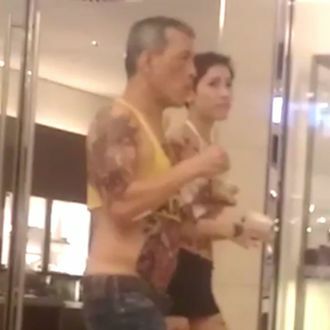 There’s a video floating around Facebook right now from 2016, featuring Thailand’s now-King Maha Vajiralongkorn strolling around a mall in Munich, wearing a yellow crop top. It’s, um, something. Three cheers for body positivity, I guess. But if you live in Thailand, or happen to be accessing Facebook there, you probably can’t see it. The company is currently blocking the crop-top clip under a Thai law that bans publicly insulting the monarchy, Vice News reports. King Vajiralongkorn is accompanied by one of his mistresses and a bodyguard in the video. (For a little context, this isn’t the first time he’s gone for a jaunt wearing half a shirt, and he once declared his poodle, Foo Foo, an official Air Marshal.) Punishment for insulting the Thai King — like, for example, sharing the above video on social media — is punishable by up to 15 years in prison, according to Thailand’s lèse-majesté laws. The strict laws put Facebook in a tricky situation, given Mark Zuckerberg’s penchant for espousing his strong belief in freedom of speech, while still acknowledging a need to respect local law. According to a report from Bangkok Post, the Thai government has asked Facebook to remove the remaining 131 instances of the video on its platform by Tuesday of this week or face legal action. When governments believe that something on the Internet violates their laws, they may contact companies like Facebook and ask us to restrict access to that content. When we receive such a request, we review it to determine if it puts us on notice of unlawful content. If we determine that it does, then we make it unavailable in the relevant country or territory and notify people who try to access it why it is restricted.